At least 24 hours in advance notice before the arrival date is required. 1. Check in is at 1:00 pm and check out is 11:00 am. 3. Cancellation Policy: At least 24 hours in advance notice before the arrival date is required. 4. The reception is open from 7:00 am until 10:00 pm. Sorry, NO LATE CHECK IN!!!!!!!! If arriving after 6 pm please contact us to confirm your booking, via email or we will sell your bed immediately after 6 pm. - If you require earlier check out, please tell the front desk the night before in order to collect your key deposit. 5. No smoking in the building (Please go to balconies, front garden, or bar). 6. 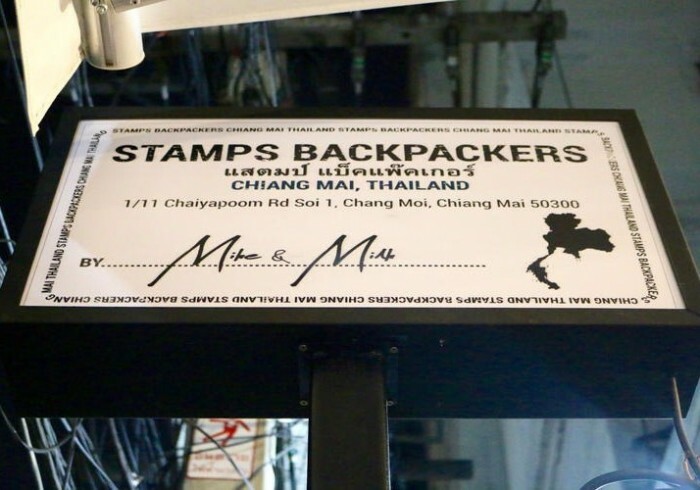 Stamps Backpackers is a youth hostel, and is not suitable for children, elderly, or pets. 10. We ask you to please respect the other guests at Stamps as well as our neighbours: PLEASE BE QUIET AFTER 10:00PM! 1) Deluxe 6 Bed Mixed Dorm: Our A/C semi-private pods are inclosed with walls and a curtain for privacy! Each pod has two power plugs, a personal table, a private light and a personal locker! 2) Basic 8 bed Mixed Dorm: Our semi-private fan dorm room is unique to most other hostels, we have built walls between bunks and added curtains to make your stay more private. Each comfy bed has its own personal big locker, two power outlets and a light! rooms are fan only rooms. Unlike most hostels in Chiang Mai our dormitories are set up using a semi-private sleeping pod concept. Alongside the single-bed pods we also offer 6 & 8 bed mixed dormitories.With either air-conditioning or fan rooms, each bed is equipped with two wall power outlets for all your electronic needs, a large backpack locker, and a personal bedside light. Our beds are comfy and private and the bathrooms are clean and of western standard. Wi-Fi access is fast and powerful for your in bed browsing! Though we are not a party hostel, our focus is on enhancing the social aspect of travel and each night we have group activities in order to create a family-like vibe. We have a common area with a bar for guests to come together and chat about their days, or to meet-up before starting out the night! There is a blackboard in this common area for new friends to chat & connect, as well as plan adventures together!